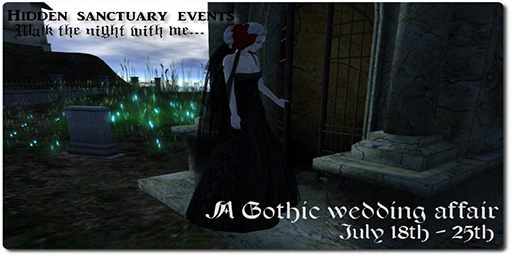 Walk the Night With Me is a Gothic event coming up in Second Life in July. Organized by the team from Hidden Sanctuary Events, the theme centers on Gothic Weddings and Tragic Gothic Romance. The theme conjures up all kinds of inspiration for your humble narrator, my droogs and devotchkas. Ashe is a lonely wanderer, clad in velvet brocade. This suit hearkens back to Victorian times, but adds a little Tim Burtonesque twist with the black and white striped lining of the coat. This is a rigged mesh suit, which comes complete with five sizes, an alpha, and attached coat and pants. It has been materials enabled for your viewing pleasure. Ashe will be available only at the event, till its end, then will be available on the Marketplace, and inworld at the main store location. As the time draws near, and booth set up is imminent, an SLurl will be provided so you can hop on over for a bit of Gothic awesomeness. Stay tuned!